Google AdWords is an online advertising program offered by Google which allows advertising through Google’s search engine. The program was introduced in the year 2000, and it has become the main source of revenue for this company. Specially designed to determine the relevance of search query in relation to the possible ad, this program places the ads on the search result page. The ad can be placed at the top or at the bottom of the page, as well as on the right side of the search result page. The ordering of the paid ads is determined by AdWords program, based on the relevance, keywords matching as well as based on the budget of the campaign. Google AdWords allows pay per click (PPC) advertising, i.e. cost per click (CPC), as well as cost per thousand impressions, also called cost per mile (CPM). Google AdWords program also offers site-targeted advertising, which includes text, banners and rich-media ads, and remarketing. The great potential of Google AdWords program is that you can reach a large number of online users, due to the large number of searches conducted on Google every day. However, the program itself offers several possibilities for advertising, which are suitable for different types of campaigns, which is why you should understand how Google advertising works before you are ready to create a campaign and run ads. Apart from the ads displayed in the search results, the AdWords program offers advertising with Google Search Partners and Google Display Networks, which will allow you to expand the reach of your ads. This way, you maximize the chances of reaching users by taking advantage of different platforms that are available as a part of Google AdWords. Choosing the network where you will run your ads depends on both your business and the type of campaign you want to create, as each network has its own distinctive features and it is better than some other in achieving certain goals. The main type of advertising associated with Google AdWords is search engine advertising. When a user types a certain phrase in the Google search bar, the user is displayed a list of search results, together with the ads that are in relation to that phrase. This is Google Search advertising. However, besides this type of advertising, Google offers advertising through Google Partners. Google Partners are the websites that use Google search engine on their website, so they present both organic and paid results on their website. This means that you can expand the reach of your campaign that is being run through Google AdWords. Probably the most famous Google partner is AOL.com, but there are a lot of smaller companies that use Google search on their websites. When you create a campaign through Google AdWords, you are automatically opted in for Google Search Partners, and you can track the conversions from your account. If you notice that Google Partners are not providing enough conversions, and thus they might be wasting your budget, you can always opt out. You should have in mind that it is not possible to separately optimize the campaign for Google Partners, but instead, the campaign that is optimized for Google Search is the same one used in Google Partners advertising. The third part of Google advertising is called Google Display Network, and it represents advertising with banners through the websites that use Google AdSense. Google AdSense provides websites possibility to create a space on the website where Google ads will be displayed, next to the content of the website. So when a user visits a website, an ad is displayed in the place assigned by the website’s owner. While it is possible to create a unique campaign for Google Search and Google Display Networks, these two require different optimization elements, which is why it is recommended that you set up different campaigns for these two types of advertising. When creating a campaign with Google AdWords you will have the option to opt in for both of these, and while it seems easier to use the same campaign for both networks, you should have in mind that these networks require different approaches. So if you want to optimize your campaigns and maximize the effect of each campaign, you should customize campaigns for two networks separately. There are several differences when it comes to choosing on which network to advertise, and those are primarily based on the place where your ad will appear. 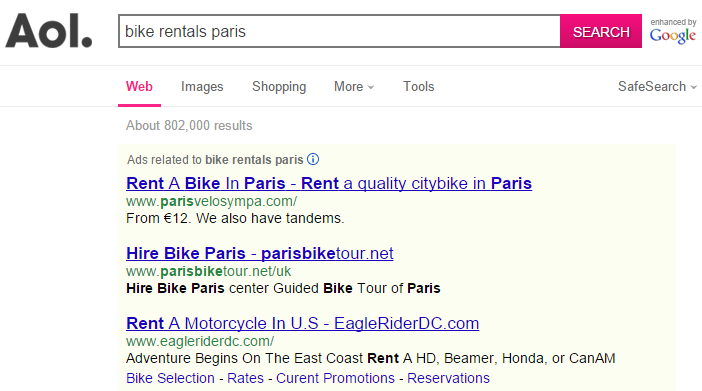 Search Network including Search Partners tries to match search query with the relevant ads. The type of ads available with this type of advertising is in the form of text ads. This type of campaign is recommended for the cases where you want your ad to appear in the search results only, when users look for a term that is related to your business. 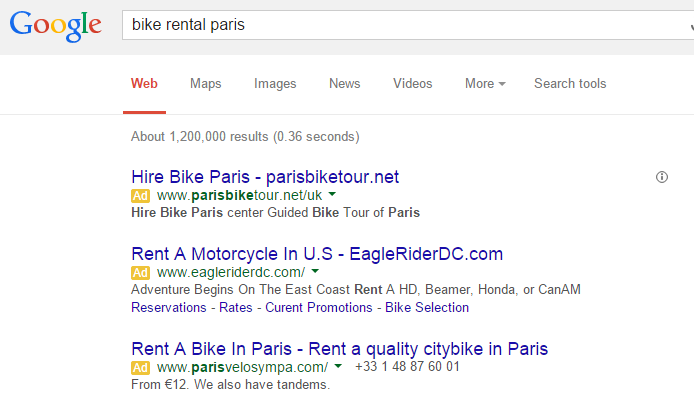 With Google Display Network, ads are being matched with the content of the website. Targeting options with this campaign allow you to target specific demographic group, pages about specific topics where you want your ad to appear, etc. The formats of the ads that are available with Display Network include: text, image, rich media, and video ads. This type of advertising is recommended for advertisers with more experience in using AdWord program, as well as in case you want to increase interest of the online users and improve the position of you brand. Therefore, product placement is a type of campaign that would benefit from Display Network. Choosing all options for advertising, Google Search (including Search Partners) and Display Network, is usually advised to beginners, who are not completely aware how and if they would benefit from a certain type of advertising. This allows you to completely maximize the reach of your campaign and target both the users who use online search tool, as well as those users who are just browsing the internet and visiting different websites. If you choose both options, the budget is being distributed across both networks. You can use text, image, rich media, and video ads. When creating a campaign you will also have to choose between different subtypes of the campaign. 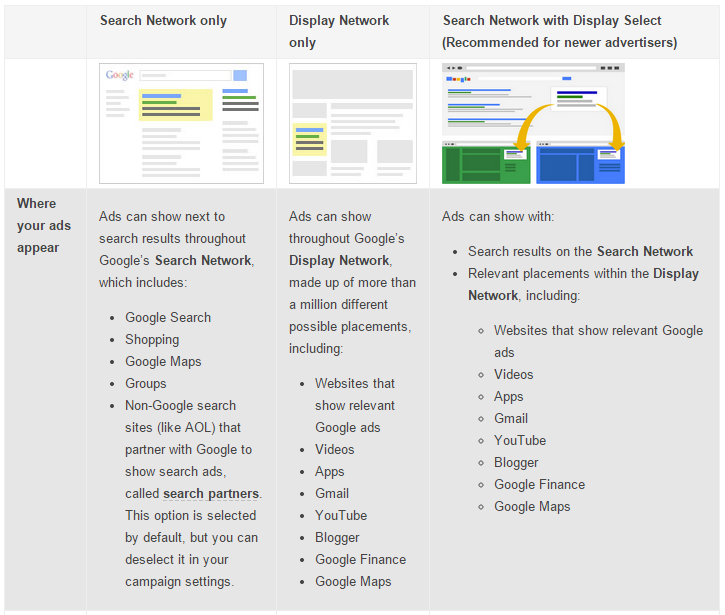 Have in mind that Google Search and Google Search with Display Network have two subtypes, including “Standard” and “All features”, while Display Network only campaign has only “All features” subtype. Standard subtype is an option that is more suitable for beginners as it shows less options and settings. This subtype of the campaign includes basic location targeting, basic bidding and budget settings, location targeting, and common ad extensions. On the other hand, if you want to completely customize the campaign and to be able to choose more advanced options and campaign settings, you should choose “All features” campaign subtype. With this option you get access to advanced social and experimental settings, ad scheduling and ad delivery methods, advanced location options, advanced keyword matching, etc. There are additional campaign subtypes, that are used for a specific purpose and they are called specialized campaign types. Dynamic Search Ads – Available with Search Network only, this type of advertising uses your website content, instead of keyword to target the ads. These ads are displayed as text ads with headline, content and landing page chosen dynamically from your website. Mobile apps – This type of campaign is available with Display Network only and it allows displaying images and text ads in mobile applications. Remarketing – If you want to show your ads, in the form of text, images or video, to the people who have already visited your website, you should use remarketing subtype of the campaign, which is available in Display Network only. Using this type of advertising you basically show your ads to the people who have already visited your website in the purpose of increasing the influence of your brand. Engagement – Allowing interactive, rich media ad formats, this type of campaign is shown with Display Network only campaign. It is useful if you want to use different media formats to promote your brand, instead of text ads. While it is possible to switch between some campaign types, you should have in mind that this will affect certain features and settings, as some of the features might no longer be available when you switch to a different type. This might also affect the performance of the campaign. However, only some of the changes are allowed between different campaign types.